The MetalCloak CJ8 Rear Flare Mounting Base Plates install easily and provide additional strength to the vulnerable wheel well opening. 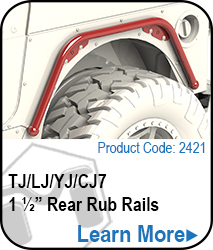 Designed specifically as a mounting system for our Rub Rail, 4" or 6" Quick Release rear flares, the flare mounting hardware is built right in. Choose the finish on your MetalCloak system. The options are Raw Metal or Premium Black Textured Powdercoat. For more information about our powdercoating process, check out the short video on the Pics & Vids page. 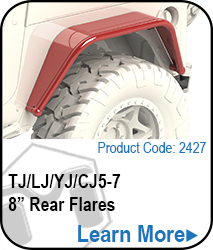 Rear Flare Mounting Plates, designed to mount the Quick Release Flares. 11GA Cold Rolled Steel Plate creates a solid mounting point for your Quick Release Flares. Adds additional strength to your wheel well. 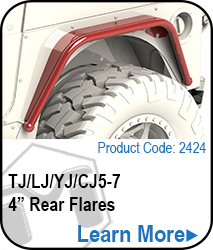 Quick Release flares available in Rub Rail, 4" or 6". 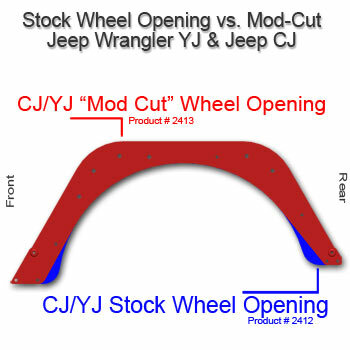 Stock wheel opening allows for up to 33's comfortably on a stock CJ8 with no rubbing and 35's on a 2" BL. 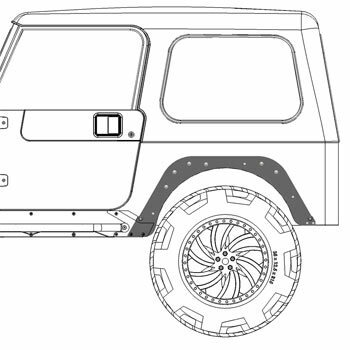 Fully integrates with the MetalCloak body armor system. Stock Mouting Plate fits cleanly on a stock wheel opening. Even the Stock Base Plate beats the Stock Plastic Flares. The Base Plate integrates with our Rocker Rail creating one solid unit of protection. If ordered in Raw Metal, we will DA the welds and clean up the product, pack it and ship it right out to you. Our Premium Black Textured Powdercoat is the best in the industry. 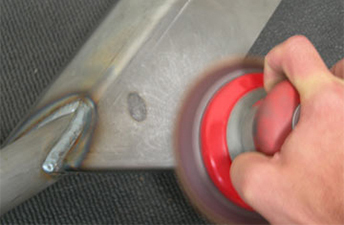 Powdercoated products usually ship out within two to three weeks. Check out our video on how we powdercoat.